Factoring in holidays, there were approximately 40,860 shuttle trips taken this year, compared to next year’s limited 12,172. The Oakland shuttle service will continue usual operation next semester, but at a reduced capacity. Two shuttles will loop between the Student Center lot and the original Pittsburgh Playhouse every half hour instead of the current 15-minute loop. A schedule provided to The Globe from Chris Hill, Vice President of Operations at the Physical Plant, states that shuttles will run Sunday through Saturday from 7 a.m. to midnight. The shuttles’ fate beyond spring 2019 remains a mystery as administration anticipates the new Playhouse downtown will result in a decrease of future students living in Oakland. Michael Gieseke, Dean of Student Life, said that it’s possible that students will begin looking into living in the downtown area, Mount Washington and the North Side instead of living in Oakland. “If we think more of our students are living downtown than not, then we may not need a shuttle at all,” Gieseke said. However, living downtown may come with a higher cost to students. According to Zillow, estimates for the median rent for a two-bedroom rental in the Central Business District is $2,466 per month as of February 2018. The estimate for Oakland is $1,260 per month, and Mount Washington is even lower at $1,159. Data is not available for the North Side neighborhood. 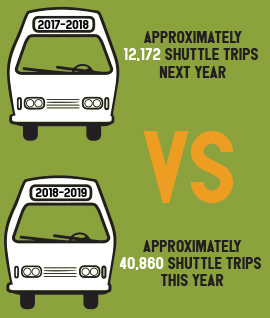 Gieseke stressed that no long-term decisions have been made and that any change in the shuttle schedules will be made based upon how often students use the shuttle over the next two semesters. He also said it was possible that the shuttle could begin running to other neighborhoods if a large influx of students moved to different parts of the city. “I’m sure we will reach out to students and determine if students themselves believe there are other areas that might be better,” Gieseke said. Some young students are still planning to move to Oakland regardless of the Playhouse’s move. Megan Clista, a freshman sports, art and entertainment management major, said she is planning to move in with her brother in Oakland her junior year. Comparing Oakland to downtown living, she said “it’s a lot more lively and accessible,” pointing out that the convenience stores and restaurants in the neighborhood campus are open later than those downtown. Emily Cofer, a freshman acting major, said she would rather live downtown. “I wanted to be as close to the school and as cheap as possible,” Cofer said. She expressed that the housing search was difficult. Pete Halapatz, who has been driving shuttles for Point Park for 11 years, expressed hope that the shuttles would continue. He has received offers from friends to be a driver at Chatham University, but said he would rather stay at Point Park, where he is more comfortable. With no definite future, the shuttle service remains in limbo until concrete data is produced during the 2018-2019 school year. According to Gieseke, the final decision on the shuttles will be made between Bridget Mancosh, Senior Vice President of Finance and Operations and President Paul Hennigan.